With 'Purple Cow', marketing guru Seth Godin refers to a product that is so remarkable that it is automatically talked about (and therefore starts selling). According to Seth Godin, cows are an extremely boring product. When did you last see a striking cow? Even though a cow is of a good breed, it is still a boring animal that doesn't interest you. You will certainly not soon remember it or tell others about it "I have seen such beautiful cow today ..." A purple cow, on the other hand, it stands out. 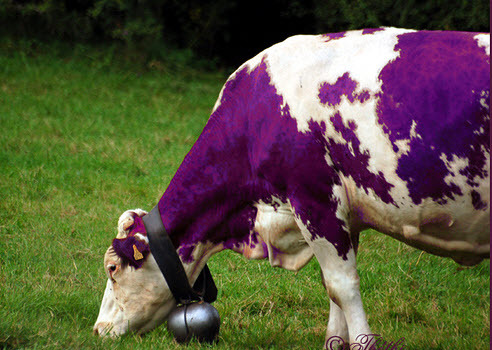 Even though the cow is of a lesser breed, people will talk about a purple cow (and it will sell), Seth Godin argues. Hoe maak je een purple cow? It will be clear that Seth Godin wants to encourage companies and (marketing) managers to distinguish themselves and to make choices. Differentiate your customers. Find the group that pays the most, and the group that probably has the most influence on other customers (the Sneezers). Find out what you need to develop, how you should advertise or how you can reward either of the groups. Ignore the rest. Meet the customers you want as customers. If you could target (and conquer) one interesting niche, what would this be? Why don't you launch a product that competes with your current product, but that focuses specifically on this market? Create two teams: the investors and the milkers. Put them in different buildings. Hold a formal ceremony when you bring a product from one group to another. Celebrate with both and let people rotate. Do you have an e-mail address of 20% of your customers who are crazy about your product? If not, collect them. If you are going to do this, what super special could you make for these customers? Being remarkable is not always about adjusting the largest machine in your factory. It may be the way you answer the phone, introduce a new brand, or adjust the prices of your software. Making a habit of doing unknown things every time you get the chance is the best way to find out what works and what doesn't. Explore the limits. What if you were the cheapest, fastest, slowest, warmest, coldest, easiest, most efficient, hardest, most hated, imitator, outsider, oldest, newest, or simply the most! If there is a limit, you must look it up (and test it). Think small. Consider the smallest possible market and describe a product that would certainly conquer this market. Think further from there. Almost everything you do is not done for a specific reason. Almost everything you do has to do with fear or slowness. What would happen if you simply told the truth within your company and to your customers? See below the explanation of Seth Godin about his Purple cow.